Made from the finest botanicals grown in the Highlands of North Carolina and beyond. Notes of citrus, florals and spice intermingle in the most delicious way to create a timeless gin for classic cocktails and modern libations. In fact, it floats over your palate so softly you could drink it alone. Chemist Gin is anything but common. Then again, so are you. Not just any botanicals will do. Chemist Gin starts by hand-selecting the finest botanicals from the Highlands of North Carolina and beyond. But make no mistake, five American citrus botanicals are the star of the show. Centuries ago this mystical technique was discovered and it’s just as effective today. Our direct-fired stills transform the spirits into vapor which passes through our unique blend of botanicals, infusing the gin with a delightful citrus-forward finish. Juniper is the very namesake of gin. 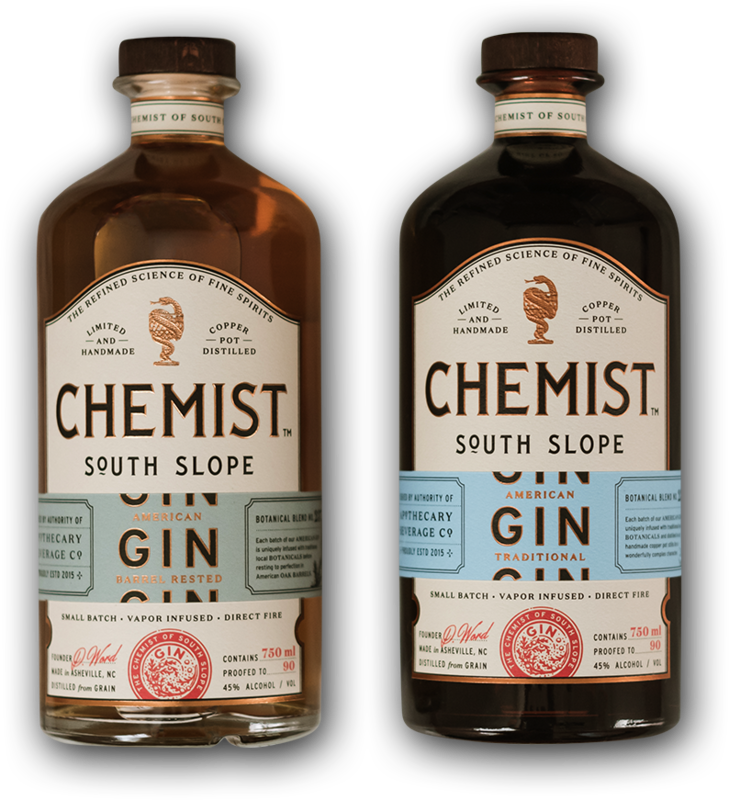 And though we have retained its distinctive flavor, you’ll taste less cypress and more citrus, florals and spice in every sip making Chemist Gin the perfect complement for cocktails or drinking neat. American Gin is a “New Western” style that uses vapor infusion to downplay the juniper and accentuate notes of citrus, rose, mint and spice. The Barrel Rested Gin is North Carolina’s first true sipping gin. Its beautiful depth of flavor is worthy of drinking neat yet balanced enough to reinvent the most classic cocktails. A whole apple with every sip. The Eau De Vie is a white brandy created in collaboration with our neighbors, Urban Orchard Cider Co. Made from 100% apples, you’ll add complexity to any cocktail or savor a comforting fresh-baked apple flavor when enjoyed neat. 100% beer with a brandy finish. Yes, you read that right. The Shadowclock Bierbrand is a collaboration brandy made with Burial Beer Co. across the street in downtown Asheville, NC. The best of both worlds does exist. Spend time with our master distiller and learn about our process of handmade gin distillation, our botanicals and get up close and personal with our craft spirits. Stay up-to-date with our latest releases and collaborations with our email newsletter. Be the first to hear about events and availability near you.